Normally the action in the gold and silver futures markets tends to be pretty similar, since the same general forces affect both precious metals. When inflation or some other source of anxiety is ascendant, both metals rise, and vice versa. But lately – perhaps in a sign of how confused the world is becoming – gold and silver traders have diverged. Taking gold first, the speculators – who tend to be wrong at major inflection points – remain extremely bullish. Commercial traders, meanwhile – who tend to be right when speculators are wrong – are extremely bearish, with short positions more than double their longs. Historically that’s been a setup for a big drop in gold’s price. Viewed as a chart with the gray bars representing speculators and red bars the commercials, and where divergence is bearish and convergence bullish, the result is pretty ugly. But now check out silver. 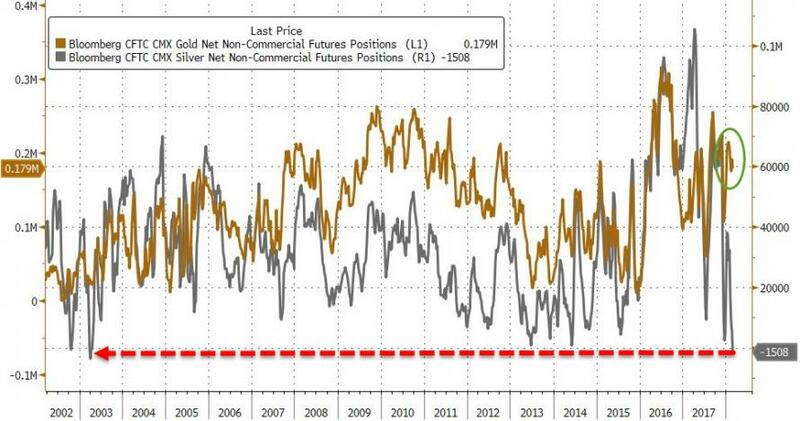 Where gold futures speculators’ long positions are three times their short bets, silver speculators are actually more short than long. In other words, the people who are usually wrong are bearish. The commercials, meanwhile, are almost in balance, which is usually bullish for silver’s subsequent action. Shown graphically, speculators and commercials are meeting the middle at zero, something that’s both very rare and very positive. What does this mean? One possible explanation is that silver has gotten too cheap relative to gold and needs to be revalued. That could happen in several ways, with both metals rising but silver rising more, or both falling but silver falling less. Or with gold dropping while silver rises, as improbable as that seems. 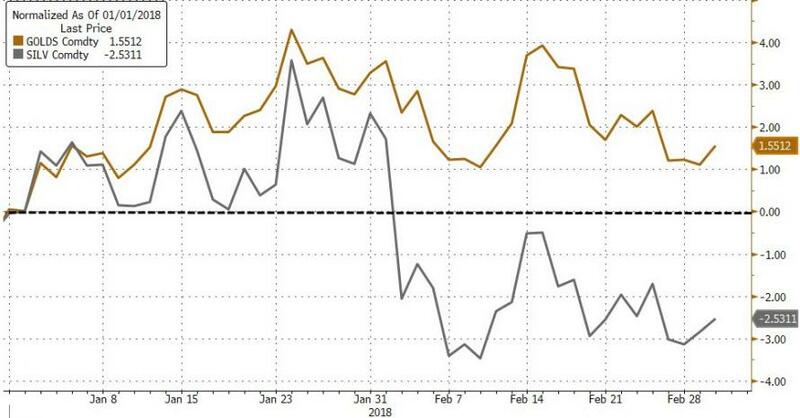 As the chart below illustrates, gold has recently been rising relative to silver (or silver has been falling relative to gold) with the gold/silver ratio now close to 80, meaning that it takes 80 ounces of silver to buy one ounce of gold. 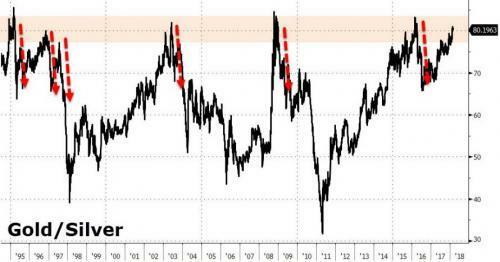 It’s been there two other times in the past decade and both times gold subsequently rose while silver rose a lot more. Based on this (admittedly short) bit of recent history, an interesting trade might be to short gold and go long silver on the assumption that silver bullion will outperform gold bullion going forward. Or just stack more silver than usual for a while. With the world’s mines producing only about 10 times as much silver as gold while silver stockpiles are dwarfed by those of gold because so much silver is used and then lost in industrial applications, this might be a trade that works for years rather than months.